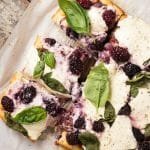 This keto three cheese blackberry focaccia is a summer must! 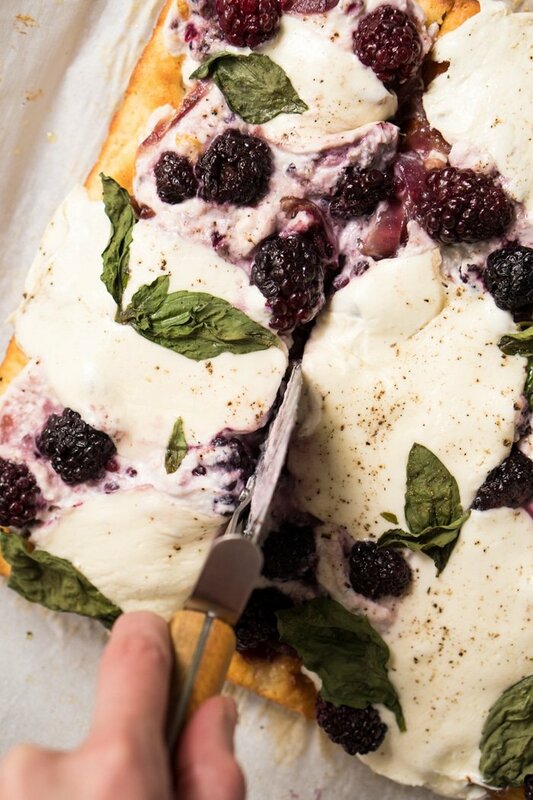 Layers of ricotta, parmesan and mozzarella meet caramelized onions and sweet summer blackberries in this stellar gluten free and low carb focaccia. Extra Fluffy ‘N Crazy Good! The burst of flavors in this keto summer main are honestly surprising, most definitely making it a personal favorite when summer comes around! 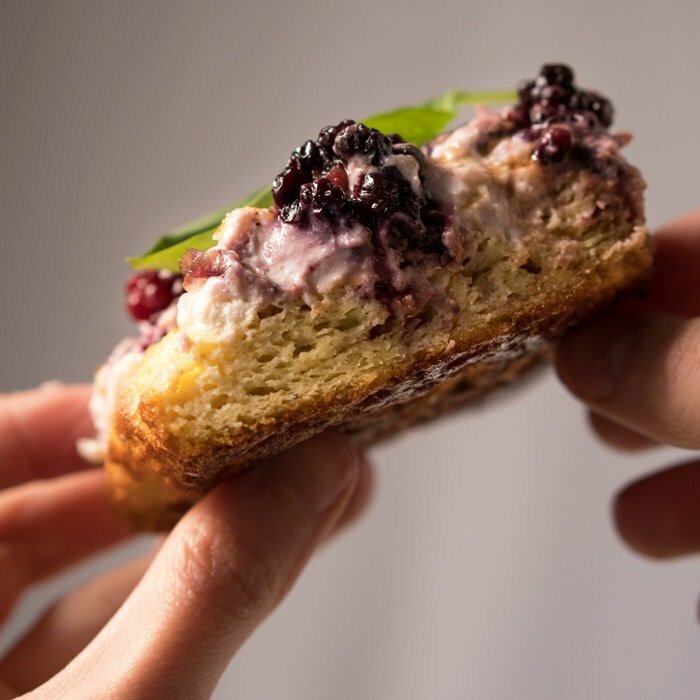 And it’s pairing with our staple keto focaccia really is one of the best combos of toppings-to-base I’ve yet to try. The keto focaccia base is soft, chewy and with a killer taste (i.e. no eggy business here!). Plus, you’ll be pleasantly surprised how easy it is to whip up! Just do check out the video for tips ‘n tricks. And the topping combo is a-mazing stuff (cannot say this enough!). I’ve been whipping this focaccia/pizza situation for nearly a decade, and it never gets old. 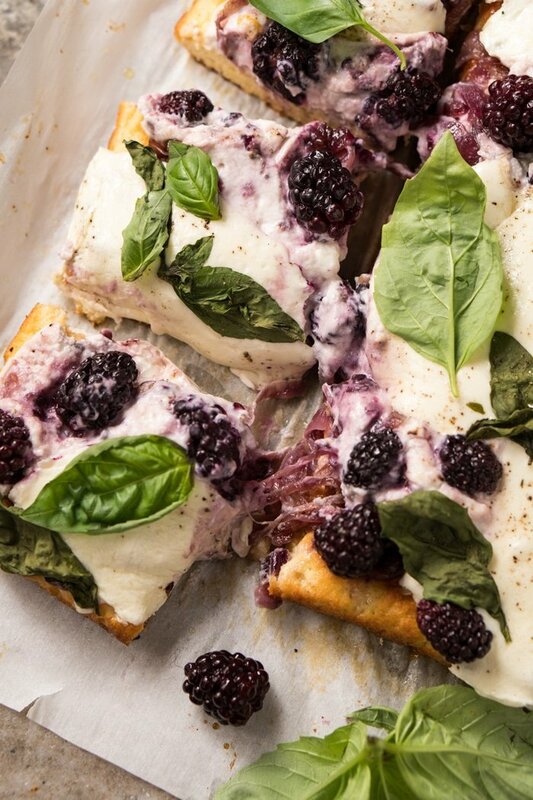 Solid proof that blackberries ain’t just for dessert! Making this low carb and keto focaccia is incredibly simple really. But, like with any yeasted bread, it does require you take care of a few details to ensure the best possible outcome. Please ignore the fact that I totally forgot to take pics of the before/after rise (#foodbloggerfail!). 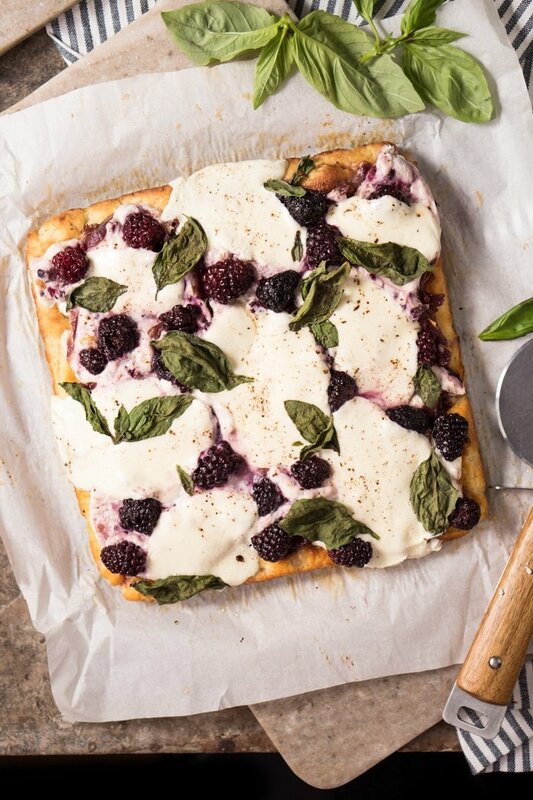 But use the focaccia as reference (same base, no toppings). Proof the yeast. This involves mixing dry active yeast with water that’s justwarm to touch (between 105-110°F to be precise) and maple syrup or honey for 7 minutes until foamy. And before you scream sugar (!!) remember that the yeast will feed on such sugar to emit carbon dioxide, so it doesn’t affect the carb count at all. And yes, this is a scientific fact. Line a 10-inch skillet or 9x9 dish with parchment paper and grease with olive oil (so the dough doesn't stick while you spread it). Dip a spatula (or your fingers) in water and spread the dough until even in thickness. With your fingers wet, make indentations in the dough. Cover with a kitchen towel and place in a warm draft-free space for 40-50 minutes until lighter in texture. You don't want the dough to double, but it will puff up noticeably (see pictures for reference). 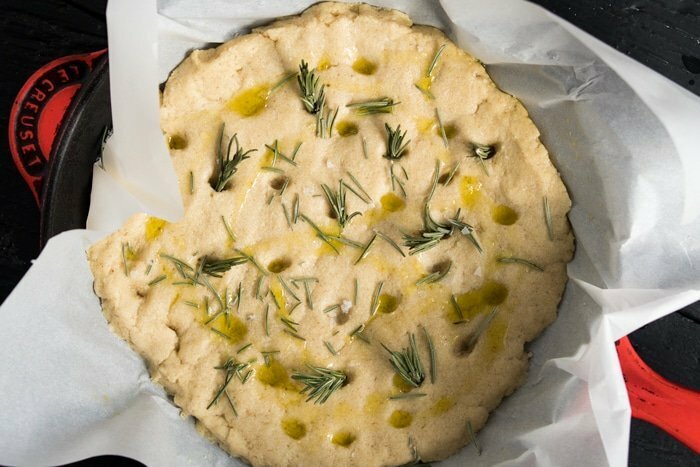 While your focaccia is proofing, heat up a skillet or pan with olive oil over medium/high heat. Add onion and cook, stirring often, until fully caramelized (13-15 minutes). 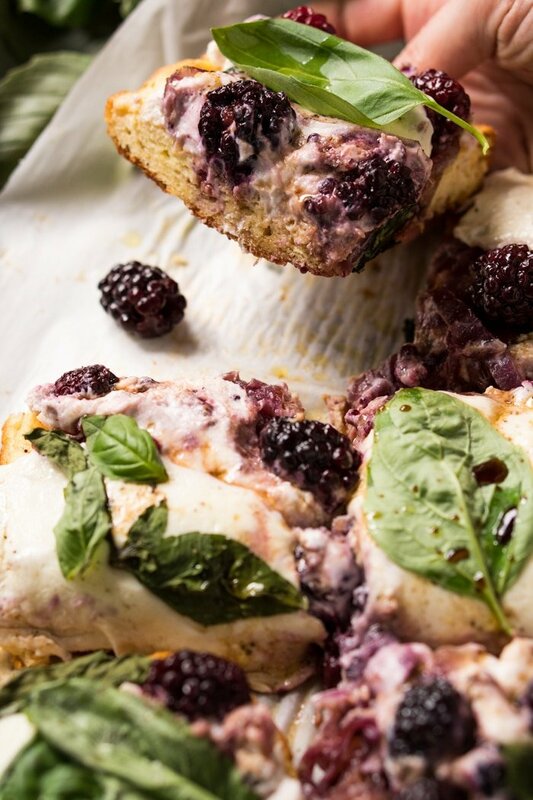 In a bowl, mix together the ricotta, parmesan, and season to taste with salt and freshly ground black pepper. Preheat oven to 350°F/180°C. And if you're baking at high altitude, you'll want to bake it at 375°F/190°C. Transfer the skillet gently into the oven and blind bake (i.e. without toppings!) for 16-19 minutes, until fully golden. 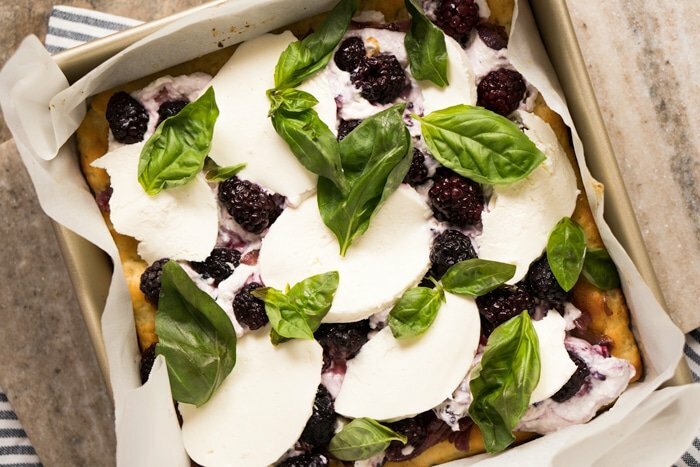 Remove from oven, sprinkle caramelized onions, spread the ricotta and parmesan mix on top, followed by the mozzarella and remaining blackberries. 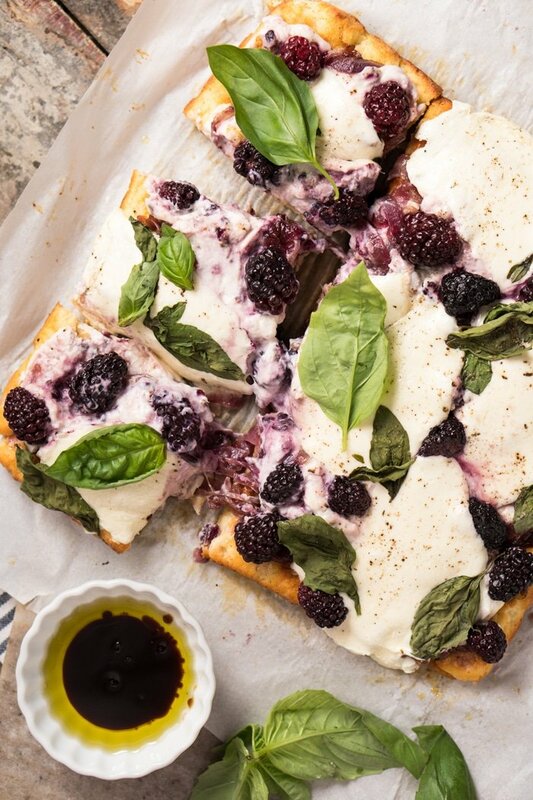 Garnish with fresh basil leaves and bake for 15-18 minutes more until the cheese is fully melted and bubbling. 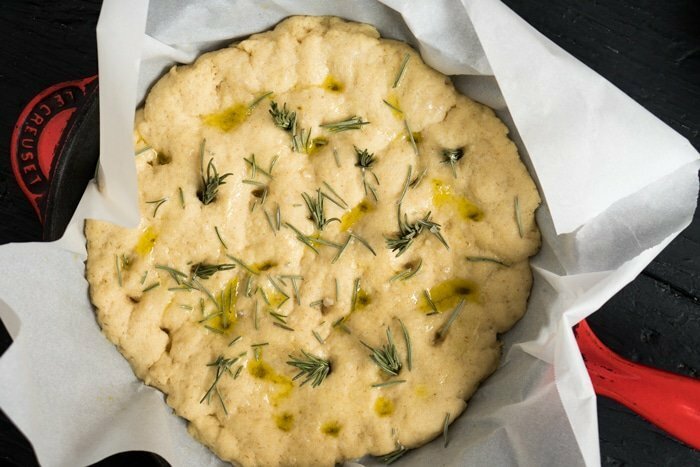 Allow the focaccia to rest for a few minutes before serving, as the texture improves drastically after just 5 minutes. Don't worry it'll still be nice and warm! Drizzle with olive oil and balsamic vinegar (or a touch of red wine vinegar if you prefer) right before serving. *Sorry for the caps, but before you scream sugar, remember that the yeast will feed on such sugar to emit carbon dioxide, so it doesn’t affect the carb count. And yes, this is a scientific fact. Please note that nutrition facts were estimated, per slice, for the focaccia with the toppings. I follow the recipe to the Letter, and I even place my proofing bread over my warming oven. Actually, I infact do all the prep work over the oven as well to have the warm air a consistent factor. I have made this bread 3 times now and cannot figure this out. Should I eliminate psyllium husk? I made this last night and since this came from Gnom Gnom, I had already high expectations. But this is even better than I dreamed. Thank you again for another amazing recipe!!! 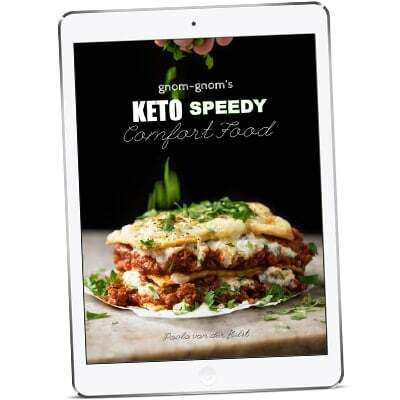 looks delicious as always, this is by far the greatest Keto website ever! 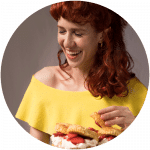 love your recipes and how elegant they look! please keep those recipes coming, cheers.